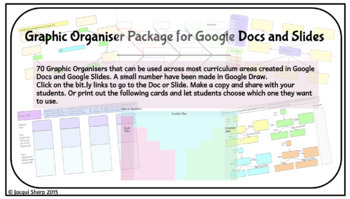 This package contains 70 Graphic Organisers that have been created in both Google Docs, Google Slides and 4 in Google Draw. There is 140 graphic organisers in total. 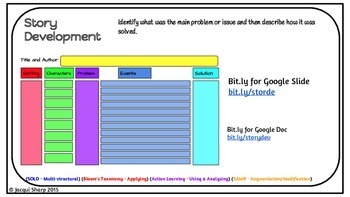 You and your students will have to have Google Accounts to use these Graphic Organisers. Click on the bit.ly links on the cards. This will take you to the Google Doc, Slide or Draw file. Make a copy. You are free to make any adjustments to the files at this point, to make them more suitable for your students. Share the file with your students and they will be able to use all Graphic Organisers on their computers, Chromebooks, iPads and Android. You will need the Google Drive, Docs and Slides apps. Most of these Graphic Organisers can be used for multiple purposes across many curriculum areas. There are a few that will be very familiar and have been around for years, some of those I have added some extra features. A few, I have created myself when I saw a particular need in a classroom. Students love using these and they certainly help in organising their thoughts and assist in their writing. There are 2 PDF files available for download. One shows the blank graphic organisers and the other file shows the examples. You can choose which one you would like to use. Each Google Doc has just the graphic organiser and where needed the instructions. 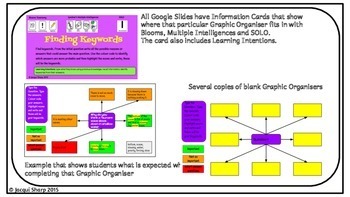 Each Google Slide Graphic Organiser also includes an Information card that shows where that particular one fits with Blooms, Multiple Intelligences and SOLO. 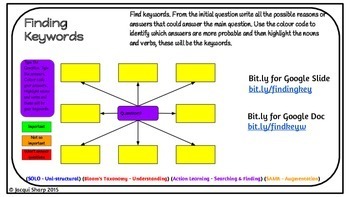 There are instructions for students that describe how to use the Graphic Organiser and the Information card also includes Learning Intentions. All the Google Doc and Slides will work on the iPad, but only if you share them to students accounts. Typing in the bit.ly link in the internet address window will open the docs and slides. Make a copy by going to File - Make a copy.